Many consider Fuertes to be one of the world’s most prolific bird illustrators along with James Audubon and John Gould, all artists whose work we carry in our online store. What many don’t realize is how passionate Fuertes was in his pursuit of ornithology (the study of birds). Over his lifetime, Fuertes visited Alaska, Ethiopia, Canada, Mexico, Colombia, Jamaica, and the Bahamas in an effort to observe and illustrate a variety of bird species. He even discovered a species of his own! Louis Agassiz Fuertes Fuertes was born in 1874 in Ithaca, New York. Fuertes was deeply fascinated with birds as a child, but it wasn’t until meeting historian and fellow birding-enthusiast Elliott Coues while attending Cornell University that Fuertes decided to become a bird illustrator and ornithologist. Fuertes began illustrating bird species, and his work was so good that he was already receiving commissions even while in college. In 1899, Fuertes joined E.H. Harriman in what we now call the Harriman Alaskan Expedition, which famously explored the Alaskan coastline for new and interesting forms of wildlife. During his lifetime, Fuertes worked closely with Frank Chapman, who served as curator of the American Museum of Natural History. On one journey the two took to Mexico, Fuertes discovered a new species of oriole, which Chapman named Icterus fuertesi after Fuertes himself. The bird is often called Fuertes’ Oriole by wildlife enthusiasts. Sadly, Fuertes was killed in a car accident at a railroad crossing in 1927, shortly after returning to Ithaca from his trip with Chapman. Fortunately, Fuertes left behind numerous decorative panels and hundreds of illustrations that were published in books and magazines all over the world. 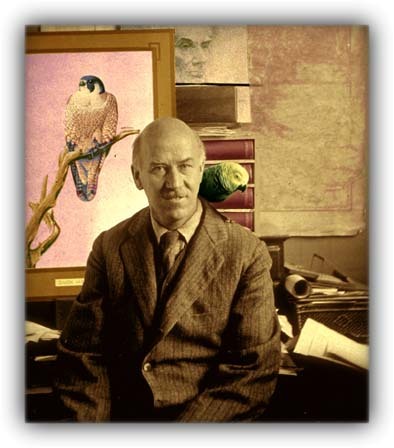 Today, his work can be seen in the American Museum of Natural History’s Ornithology Department as well as The New York State Museum and Cornell University.